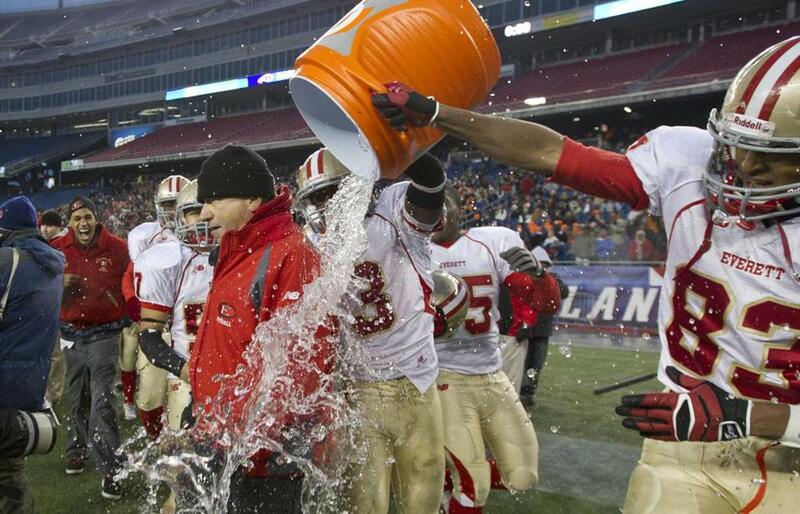 Everett players dump a celebratory shower on coach John DiBiaso, Jr. after defeating Barnstable High in the Division 1 Super Bowl. There was a hurricane, a nor’easter, and even a historic playoff vote. The fall season had its share of headline events. But if the fall is the start of a year-long marathon, then we’re off to a great start. As the winter season begins, schools such as Andover, Barnstable, and Bishop Feehan have an early lead thanks to teams that brought home state championships in swimming, volleyball, and cross-country. Now it’s time to hand off the baton. Coaches understand there’s work to be done. They teach and encourage, prod and push, trying to turn teenagers into champions. For some, such as the Needham boys’ soccer team and the Watertown field hockey team, the payoff is huge. Nothing can match the celebration enjoyed by a handful of teams and individuals this fall. Selecting 10 worthy success stories from a season filled with candidates isn’t easy. Here, in no particular order, are 10 we thought stood out. Most family photo albums are private. But the Rocha photo album is there for all to see on page 13. Catarina Rocha, one of the most accomplished runners in state history, is joined by her father and coach Joe, a combo that’s been pretty much unbeatable. We can’t tell you how the Peabody star did in San Diego Saturday at the national championships. Blame it on pesky newspaper deadlines. But on courses this fall there was Catarina . . . and the battle for second place. An EMass title was followed by a state title, followed by a Foot Locker Northeast Regional title, followed by a trip to the nationals in sunny California. Can’t wait to see the pictures. 3: Hey, where’s everyone else? It may not have beeen the biggest vote taken this fall but the decision by the state’s MIAA-member schools to dramatically change football’s postseason was a huge step. No longer will 19 teams say, “We’re No. 1.” No longer will Super Bowls be spread across the state. No longer will Tuesday night semifinals frustrate school administrators, parents, and yes, even journalists. Will it be a good thing? Will it hurt Thanksgiving rivalries? Time will tell. But the 161-131 vote means the majority think it is worth trying. “Excellent day for high school football,’’ said Xaverian athletic director Charlie Stevenson after the vote. On a busy November Saturday one of the most impressive performances was turned in by runners in Lowell. The Red Raiders won both the boys’ and girls’ Division 1 EMass cross-country team titles, a feat never accomplished in Division 1. The boys placed four runners in the top 10, led by senior Patrick Coppinger’s third-place finish. The girls had four in the top 14, led by senior Bryanna Allison’s fourth-place run. “I think we ran relaxed today,’’ said Lowell coach Phil Maia of the pressure his runners felt. We’re not sure what that means but it clearly worked. If golf is your sport of choice in the fall, you quickly become an expert on the weather. Sure, September is nice, but by late October little things like a hurricane can spoil a good walk. Despite all the postponements, one thing is clear, Massachusetts has some good golfers. Take Needham’s Jake Shuman. The junior’s round of 70 won the South sectional. His 72 a week later won the state title on a cold, gray November day. And the most important part of his game? He understands fall golf. “I’ve played enough golf in New England to know when it’s this cold, the ball doesn’t go as far and it’s hard to compress.” And don’t forget to dress warm. Back in September, what Cape school did you see hoisting an MIAA football trophy on Dec. 1? Barnstable? A good choice. Maybe defending champions Bourne or Dennis-Yarmouth? How about Upper Cape? Did you see that coming? The tiny Division 5 school didn’t waste any time moving up the football ladder. This fall the Rams went 10-1 to win the Super Bowl in just its second year as a varsity program, beating Dorchester, 22-8, in the title game. “It hasn’t really hit me yet but I’m sure it will hit me soon,’’ said Jon Dumont, who ran for 120 yards and scored twice against Dorchester.